Well, I guess I'm finally getting around to this biz. I've been meaning to write this one for like three months and for some reason, a Wednesday night (when my arm is still being all goofy and I have to stop working on the art I was doing) is the time. Because I'm me and I read and watch as much stuff as I do, I often end up drawing parallels between things that don't seem at first to go together. I've thought that I ought to write about this stuff but I tend to not get around to it so... this is me getting around to it. Bleak House is a novel by Charles Dickens published in installments between 1852 and 1853. This novel was highly recommended to me by my lit major friend, Kristin, and I was like, "I've never read any Dickens before. Why not just start with this super complicated novel about an over-complicated court system that doesn't exist anymore?" Thrilling, right? I mean, I don't even need to write this post. Game of Thrones is a series of novels by George R.R. Martin. 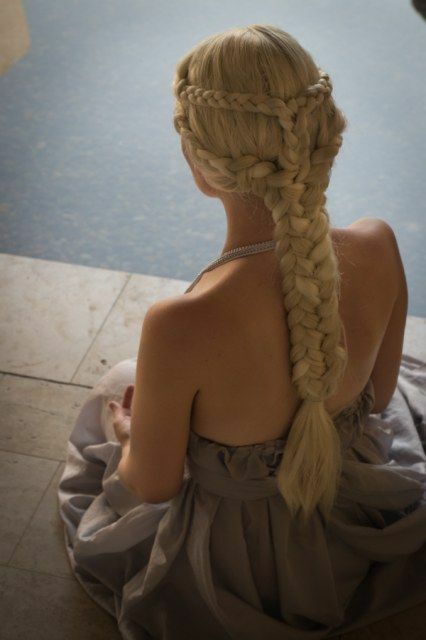 I mean, if you're reading this blog and you don't know about Game of Thrones, you're probably doing something wrong. Anyway, I tried, when the show first started, to watch. I just... I just couldn't. Earlier this spring, I tried again. Still, I just couldn't. Then, this spring, I read a case for GOT via some Pin on Pinterest and decided to try the books. I was immediately hooked. I stopped reading after A Storm of Swords because the books were literally keeping me up at night and, I don't know if you know this about me, but I'm basically addicted to sleep. I NEED it. Fog everywhere. Fog up the river, where it flows among green aits and meadows; fog down the river, where it rolls defiled among the tiers of shipping and the waterside pollutions of a great (and dirty) city...Chance people on the bridges peeping over the parapets into a nether sky of fog, with fog all round them, as if they were up in a balloon, and hanging in the misty clouds. Gas looming through the fog in divers places in the streets, much as the sun may, from the spongey fields, be seen to loom by husbandman and ploughboy. Wisps of pale fog drifted through the night, long white fingers off the river. Men and horses plundered through the predawn chill; saddles were being cinched, wagons loaded, fires extinguished. The trumpets blew again: hurry hurry hurry. In spite of all the apparent nihilism and general awfulness present in the respective worlds of these novels, characters never give up and continue to fight for their cause, their family, their friends, their life, their land...whatever. They fight. Both of these books are way into the messy stuff that happens when people get together with other people (ie- society) and everyone has their own incentives and goals and whatever. Most of the people in these narratives are just plodding along in life and aren't aware of how their actions affect the world around them. I defy you to tell me which adaptation this image is from. So the UK has like eleven actors and they just breed them to get new ones. 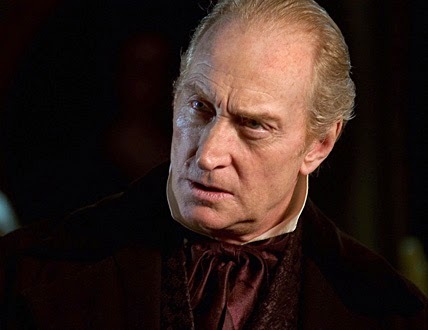 Charles Dance is one of those proud few and he portrays a totally-not-a-shade-of-gray bad guy in both narratives. Tulkinghorn and Tywin Lannister. These dudes are not to be messed with. Except until they are. And then it's awesome. Ok, so this is the thing that actually made me want to write this post. Both novels are vast and far-reaching and told in varying points of view. In Bleak House and Game of Thrones the plot threads are at first scattered and apparently unrelated. As the novels progress, those threads are braided together but still told from these disparate viewpoints. This isn't anything new but in both books, there are a lot of these plot threads. Like... a whole lot. It's like the fishbone braid of narrative structure. In Bleak House you get Esther and in Game of Thrones you get Arya. These young women collide with several other characters and those collisions are often recorded through the POV of said characters while Esther/Arya are none the wiser about that character's thoughts/feels. Get it? I love this mode of storytelling. I guess there are more things I could talk about but probably it would just devolve into how I have a weirdo crush on Sgt. George and how the passage about Joe absolutely crushes me every single time I read it and what I would do if I were Mother of Dragons--it's smoting, mostly. So, I'll stop things here. 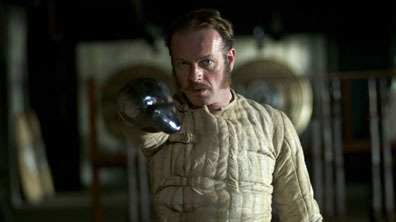 Wrap it up nice and tight and stretch out on the couch with an ice pack and a cup of tea and Elrond. PS- I called this thing "Parallax" because I wanted something catchy that had to do with Star Trek. If you're interested in what a parallax actually is you can go watch animated gifs on Wikipedia.